When the Soviets went into Afghanistan in December 1979, they figured it would be a simple job to take over the country and pacify the Muslim population. This turned into a ten year slog, and it did not take the Mujahedin long to figure out Soviet weapons were best when used to kill Soviet weapons. The RPG-7 easily sliced up the T-62, which was by then 20 years old and designed to 1950s requirements. They also used mines and the first improvised explosive devices – IEDs today – to hobble or destroy tanks and other vehicles. The solution was a complete package of improvements which could be easily mounted on the T-62 tank. Called БДД (which expanded to Bezopastnost’ Drozhogo Dvizheniya or Road Movement Security) the package both upgraded the T-62's combat capabilities as well as vastly improve its protection against RPGs and mines. This included: a passive armor array on the glacis; passive armor arrays on the turret cheeks, nicknamed “Ilich’s Eyebrows” after Brezhnev; a passive armor array on the belly extending back to the second road wheel station; a suspended driver’s seat to keep him from directly absorbing mine blasts; steel mesh reinforced side skirts; and “Tucha” smoke projectors. Offensively the tank also received a laser rangefinder over the main gun. Photos show most of the tank so fitted were actually Model 1962 or Model 1966 variants of the tank, but later the Model 1972 was fitted. These latter tanks are still in service with the Russian Army (50 years after entering service!) and many are now fitted with “bar” or “slat” armor as well. 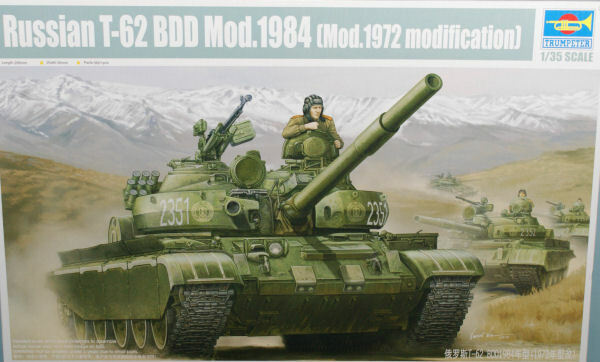 While this option has been available as an aftermarket kit for some years (as well as being part of the similar upgrade that yielded the T-55AM2 series tanks) this is the first time it has been offered as a complete model kit. This is Trumpeter’s third look at the T-62 but they still have not fixed the hull profile at the rear; the engine deck slopes down and the rear plate fits at nearly a 90 degree angle to the deck, giving it a slight backward slant. Alas, the kit still has the rear set at 90 degrees to the ground. At least once the auxiliary fuel tanks and unditching log are in place it is hard to see the angle. As with the Model 1972 Trumpeter did change a considerable amount of parts from the Model 1962 kit. First off, they replaced the original OMSh track (T-54/T-55 style) with RMSh tracks (T-72 style) and a new set of drivers to fit those tracks. These are single pin “dead” tracks and are provided in the kit as single link track. The turret is the later production one and comes with a nicely done loader’s hatch with separate race and an eight-part DShKM machine gun with a very nicely done muzzle brake; it does not have a “slide molded” muzzle for the tube but is clear from side to side, which is normally the harder part to clean up. The model has a new engine deck with new covers and details, and a separate fording cover for the fan exhaust is provided; oddly there is still NO grille to go underneath it so you have to cement it shut. All of the other engine vents have etched brass grilles over them as well as separate fording covers. An option is provided for KMT mine roller mounts on the bow or smooth, albeit the illustration of the smooth lower glacis (part C13) is upside down. This time no drilling is indicated for the turret shell as it does not mount “desant” handrails or spare 12.7mm ammo cans. A travel mount for the DShKM is included (part E3) and the modeler has a choice of where to attach it to the turret. The casing ejector port (part G1) is also separate. The OG-2 searchlight mount is a bit spartan but I think most modelers will not notice (it is actually two thin steel plates held apart by rubber spacers to provide shock absorption to the searchlight bulb, but here it is partially hidden by the right cheek applique). The commander’s OG-3 is better and has a more accurate mount. All other details remain as before. The hull is molded as a tub with torsion bar mount and belly pan details in place, and other details are present on the upper hull as well. The suspension is completely separate and provides for the “lever arm” shock absorbers, even providing special corner wheel sets for each one. Each wheel has a separate tire in black styrene and creates a wheel unit with relatively accurate width. The tires bear the external mold markings found on some tires but are easily removed, but as with most round objects the tread face will need sanding or trimming as well. The “starfish” shape is pretty accurate and the wheels are index so they line up spoke in opening like the actual wheel sets. Details include the track bumpers (four per side), fender guards and separate fenders. The fenders even have the drain holes present in each straight run and the front and rear tips are separate items. Details about and in many cases you have options. The fuel tanks are not bad for the early ones, and Trumpeter seems to be aware of the fact that the rear pair on the right fender are linked together by an angle iron strip; the kit has them molded together with the iron in between. But if you wish to “plumb” the tank this is a bit awkward, as the fuel line connections go in between the tanks and will be hard to drill out with the tanks connected. The modeler still has a choice between a turned aluminum gun barrel or a five-piece styrene one with a “slide molded” bore, both of which then take an etched brass ring with the bolt heads on the bore evacuator. However, the muzzle depth is not wide enough; the opening is correctly gauged at 115mm (about 3.2 mm) but somebody did not realize the cap on the muzzle is designed to protect the muzzle crown and is much larger (about 135mm or 3.8mm). While this is easy to fix with the styrene barrel, it will be tedious with the aluminum one. Two mantlets are provided, one “pigsnout” and one with a weather cover. Fittings overall are petite and nicely done, and all lenses for lights are separate components as well. For example, the tow hooks have the cable retainers included as separate parts and the tubular guard for the headlights comes in two pieces to get a proper design. There are still minor glitches in the kit. As an example, there is still no heat shroud between the oil tank (B-10) and the exhaust outlet (C-6). Decals consists of a targeted sheet for two specific tanks: a Soviet one with a rare four-digit bort number and unit markings in Khaki No. 2, and an Afghan Army tank with tricolor camouflage and post-1979 Afghan Army markings. Color four views are provided for both tanks along with recommended color matches for Mr. Hobby, Model Master, Tamiya and Humbrol. Overall while it is disappointing that Trumpeter still has not fixed the two main bugaboos with this kit it is nice to have an easy to install BDD package for the old warrior.